This could be added as the 31st Article in the UN Declaration of Universal Human Rights but would probably need to be placed between the current Articles 18 and 19. Everyone has the right to freedom of choice of identity regarding race, colour or gender regardless of actual race, colour or gender. 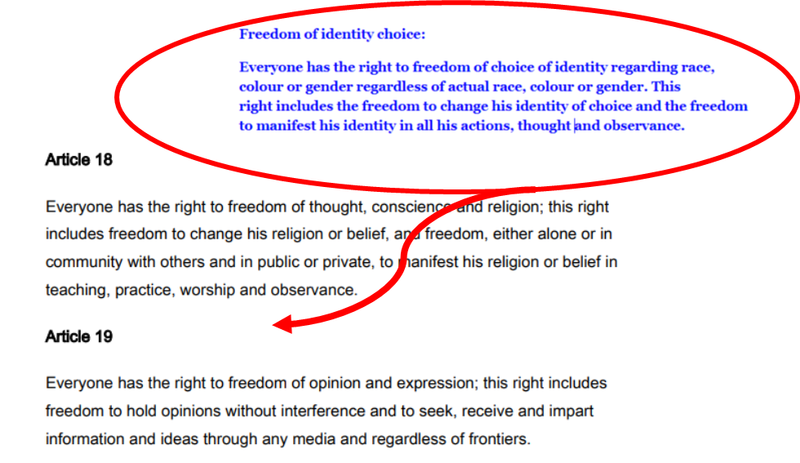 This right includes the freedom to change his/her/its identity of choice and the freedom to manifest his/her/its chosen identity in all his/her/its actions, behaviour, thought and observance. A new fundamental human right? This entry was posted on March 26, 2018 at 3:13 pm and is filed under Behaviour. You can follow any responses to this entry through the RSS 2.0 feed. Both comments and pings are currently closed.